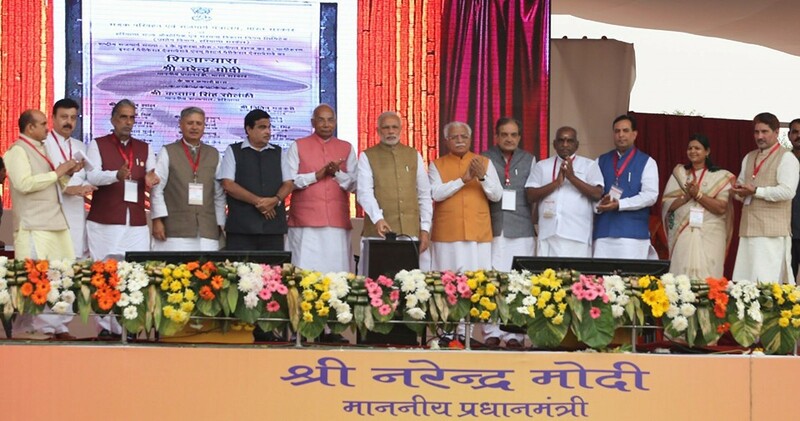 The Prime Minister, Shri Narendra Modi at the Foundation Stone laying ceremony of NHAI Projects in Sonipat, Haryana on November 05, 2015. Pointing out that infrastructure was pivotal to national development, Prime Minister Narendra Modi on Thursday said his government was actively working to strengthen infrastructure, be it road and rail networks or power and water.Strengthening infrastructure facilities would not only improve the quality of life but also provide ample employment opportunities to the youth, he said while addressing a 'Vikas Rally' after laying the foundation stone of three major highway projects at the Rajiv Gandhi Education City, Kundli, near here.Without naming any political party, the prime minister said that earlier governments at the Centre used to remain in a dilemma over whether development ushered in by them would convert into votes or not. "This practice was going on in our country for the last so many years which became a hurdle in the development of our nation," the prime minister said. The three highway projects are Western Peripheral Expressway, Eastern Peripheral Expressway and eight-laning of highway section from Mukarba Chowk (Delhi) to Panipat. He said it was a general perception that if one had the money, one could construct roads. On the contrary, the prime minister said, money automatically flows in if roads were constructed.Expressing concern that 123 districts in the country were still not connected with national highways even 60 years after Independence, he said that the central government had now decided to connect these districts with national highways under 'Bharat Mala Scheme' for better road connectivity. "My dream is to provide electricity to every household by 2022 when India would celebrate 75th year of Independence," the prime minister said. Congratulating Haryana Chief Minister Manohar Lal Khattar, Modi said commencement of road projects entailing expenditure of about Rs.32,000 crore in a year was a big achievement for a small state like Haryana.Khattar said these projects would prove to be Diwali gift not only for the people of Haryana but also for those from Delhi, Rajasthan and Uttar Pradesh.